Check out past events to see all the activities! 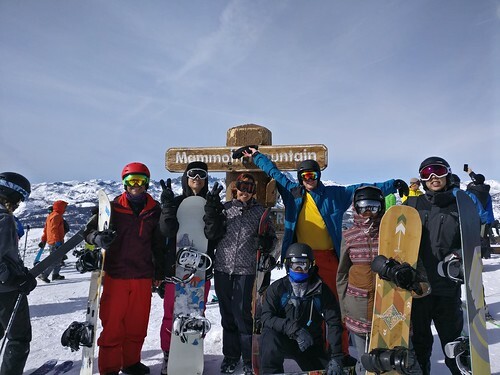 This year's UCI EAS Mammoth Trip was bigger than ever. After including the fun of all alumni and not just Engineering and ICS, we had even more fun with 28 attendees total! We got to enjoy the slopes together as well as share some food and then enjoy the soothing jacuzzi on Saturday night. There was endless excitement throughout the Friday through Sunday trip from hot tubbing to hanging out playing games at each others cabins! We want to thank everyone who was able to make it out for a weekend we'll keep talking about until next year's great event that bonds all of the UCI alumni, family and friends together! 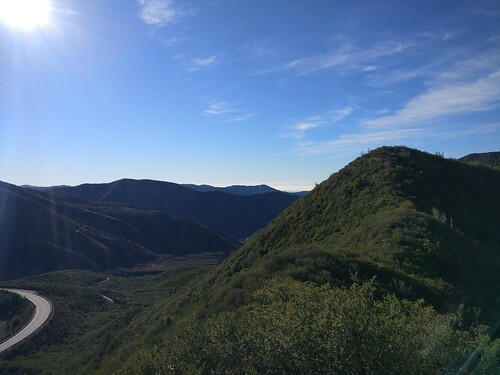 On a lovely December morning, we set off into the beautiful San Gabriel Mountains for a trip that was relatively easy until we got near the peak which was a very steep and fun scramble to the top in less than half a mile. Our group of UCI alumni (and dog) and ASCE pals enjoyed hanging out on this mostly leisurely stroll to the base of the ascent. From the top, we enjoyed lovely views of a snowy Mt Baldy as well as gorgeous and shimmering views all around us on this clear and bright day. We finished off the day by checking out some local San Dimas establishments for some nourishment and refreshment before we said our goodbyes and got back to the workweek grind! 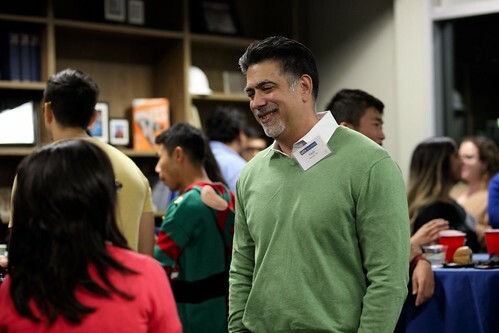 UCI EAS celebrated their 2nd Annual Holiday Mixer at the Newkirk Alumni Center with special guest speakers, Dean Gregory Washington and civil engineering alumnus and business owner, Andy Nguyen. The night started with a great mixer followed by an amazing speech from Dean Washington about the great improvements going on within the school! Lastly, we learned from Andy Nguyen the struggles and ways to overcome working a regular day job as well as managing a photography/videography business. The event was a huge success with over 30 attendees and conversations that continued late into the evening. This fun and short 3-mile hike was a great way to start of the cooler weather in the sun. We got to see the Wisdom Tree, go to the tallest peak in Griffith Park, and see the backside of the Hollywood Sign as well as Lake Hollywood! 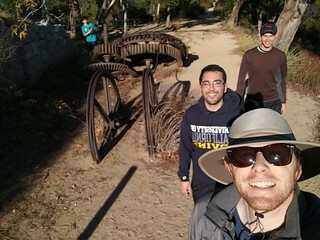 We had an amazing group of UCI EAS as well as other engineering groups for a fun social and healthy hike! In our 3rd year of this amazing Halloween Celebration we had an amazing time with even more impressive costumes! 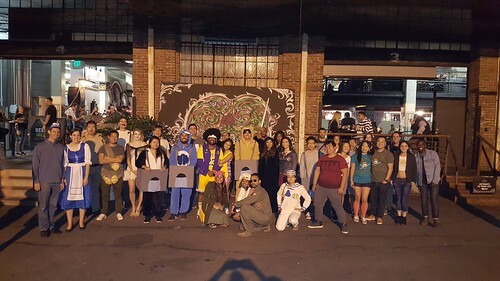 We were lucky enough to have our largest turnout with over 30 attendees and almost 20 different costumes! We had a great UCI EAS attendance along with our friends at the American Society of Civil Engineers who were a delight to spend this fun evening with. The winners for the night ended up being a marvelous Ned Lanister costume, followed by a 50 Shades of Grey couple costume using grey paint swatches, and then finally an engineering group costume of a stormwater diversion system! All in all, we had an amazing night of many facets with great experiences, conversations, and memories to last us until next year! 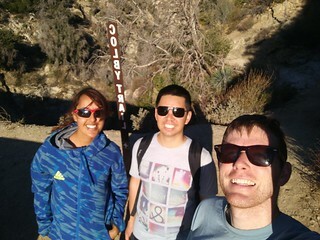 We had a spooky hike this October with a fun hike in Griffith Park around the LA Haunted Hayride as well as through some windy trails with skeletal trees as we made our way up to an equally strange Bee Rock which had amazing views from Glendale to DTLA. This cool day was a perfect way to do this hike which proved to be a little more moderate than originally thought but gave us an excellent workout with spectacular sites! Thanks to everyone who made it to our hike! 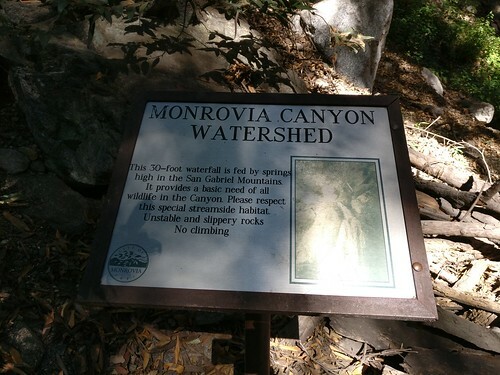 We got to enjoy this year long waterfall and beautiful nature park near LA County's Sawpit Dam as well as get to explore the Monrovia Canyon Watershed. This event was really a treat as we had some delicious Guisados tacos and got meet and learn more about our new board members and some new general members. It was a fun night of learning about what UCI EAS has to offer as well as an opportunity to showcase the work that Anteaters are doing in their respective positions. Our annual LA Bonfire was a hit with over 20 people at this festive event. 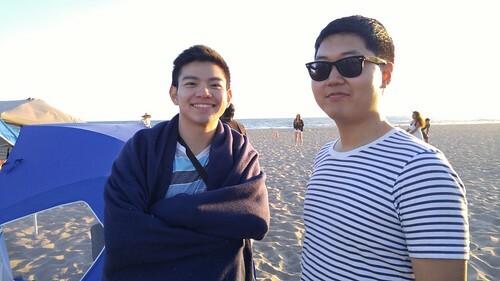 We enjoyed playing lots of ultimate frisbee, surfing the waves, as well as enjoyed some delicious bbq with our friends from the American Society of Civil Engineers, Younger Members Forum. All in all, it was an exciting day where some people roasted their first s'mores and enjoyed a beautifully warm bonfire that also had some beautiful blue color to it! It was truly a magical day. August's monthly hike brought a huge crowd! 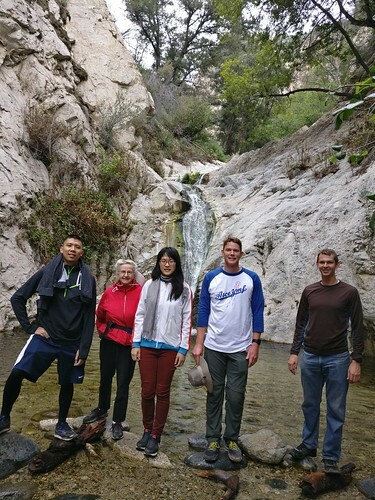 We all enjoyed this great hike which include a spectacular waterfall that had everyone playing in the cool water below as well enjoy seeing all the different dogs that joined many hikers. It was a fun filled hike, seeing all sorts of engineered flood protection devices as well as a nice bridge that went over the trail that we climbed up to for some great views and an even better picture! Our large group of 15+ UCI students and alumni enjoyed this interesting tour at LA Department of Transporation's ATSAC center. We had a great time asking our gracious host/tour director, Jeffrey Xu, many questions and learning a ton! We learned how all the different traffic systems work in the City as well as how they have special hardware that help track transit and help expedite late trains/buses as well as give priority to emergency vehicles. The shear amount of screens in the center were a little overwhelming but a great view of all the different kinds of intersections in the LA area. We also got a good look into how they do the phase diagrams for complicated intersections that involve busways, light rails, etc. It was a great experience learning about what it all takes to make LA move! We had a great day at Marina Bay with a paddleboarding lesson from the UCI Sailing Center and the brunch at the Lighthouse Cafe nearby! Join us next time for more paddleboarding and even more kayaking! This hike was beautiful with flowers in full bloom adorning the nicely shaded path. 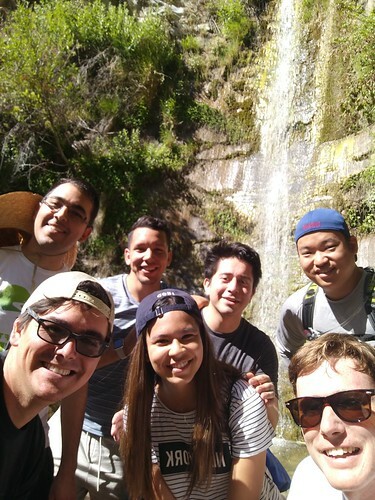 As we got outside of the riverbed and into a more open area, we began enjoying the vast hillsides until we reached the site of a gorgeous waterfall from a distance. From high up we check out the top of the waterfall and then made our way down to the base of the falls where we got to enjoy the roar of the water and cool off by the droplets from above. This mid may affair brought us to the beautiful campus of UC Irvine where we got to reminisce of the days of yore and share our experiences with the intelligent students. From amazing giveaways to hearing the Engineering and ICS Deans speak about what's going on in the schools, there was much excitement and buzz around the room all night. 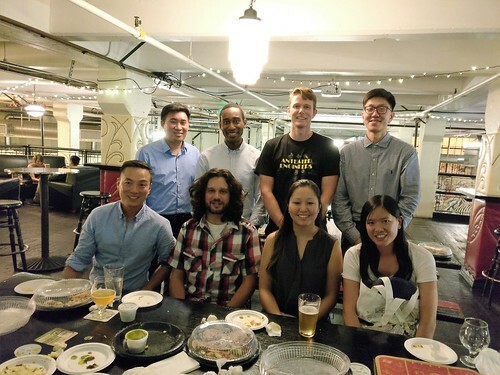 We had some great networking, with openings from jobs as well as getting contacts for conferences and board members for the ICS Alumni Chapter as well as the UCI Engineering Alumni Society! A special thanks goes out to the School for their generosity of hosting the event and providing the delicious food and drinks. Another shoutout to the Alumni Association for their donation of other giveaways for the event. For more pictures, visit our photo page here. May's Mother's Day brought us a beautiful time out in nature along with a mother who was excited to join us and her son. We arrived on this foggy and misty morning with a cool hike that kept us asking for more. From the rocky mountains to the babbling creek, we got to enjoy this amazing hike that had us tiptoeing over rocks over the stream and enjoying the forest we were trekking through. Being accompanied by a fun and talkative group, we had amazing conversations and a happy time! 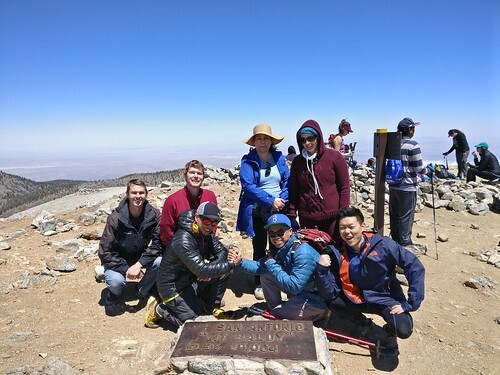 April's monthly hike was to Mount San Antonio aka Mount Baldy. From San Antonio Falls to the vast peak of Mt. Baldy, we enjoyed this 11+ mile hike that had many surprises in store for us. The hike began early in the morning but it was worth it with a gorgeous waterfall, right at the beginning. After the waterfall, we made our major journey and stopped at the Sierra Club Ski Hut. This historic place, built in 1937, gave us a nice stopping spot to check out the hut as some people were there and let us get some of the fresh spring water that is always flowing in the hut. From the ski hut, we made our way up Baldy Bowl which was a tough challenge as we trekked up to the peak. Near the peak, we were lucky enough to see a bighorn sheep and got some closeup views of it. At the top we were above the blanket of clouds that spread throughout most of the area with only the desert showing signs of land. We finished the hike going down Devil's Backbone Trail down to the Mt Baldy Ski Resort which brought us a well rewarded lunch break at their restaurant. From there, some took the ski lift back to the car while a couple others completed the whole loop on foot. It was a tiring but rewarding day that was nice a cool with amazing views. ASCE LA YMF was at it again with an amazing joint event with a couple of engineering groups whilst celebrating an early St. Patrick's Day. We gathered together at Block Party in Highland Park for a variety of delicious street food with lots of vegan options as well as enjoyed some delicious pizza from a nearby pizzeria. The drink options at Block Party were vast from snowcone drinks to fridges of bottled and canned beers. We reveled in competition while playing shuffleboard and shared warm conversations in the cool, open patio that welcomed us all. All in all, it was a fun and memorable night and we hope to continue our annual St. Patrick's Day fun for years to come! The Hike to Dawn Mine was quite a spectacular one. We had a rare chance to follow a river directly to an old mining site that still had some equipment that was left there years ago. From there, we were able to soar out from under the canopy of the river and explore the grand vistas from the top of an old railway site that went up to Mount Lowe. The gorgeous nature and views of this hike made the 6+ miles well worth it and an amazing expierience! January's hike, the first of the year, started off our hiking series with a blast. 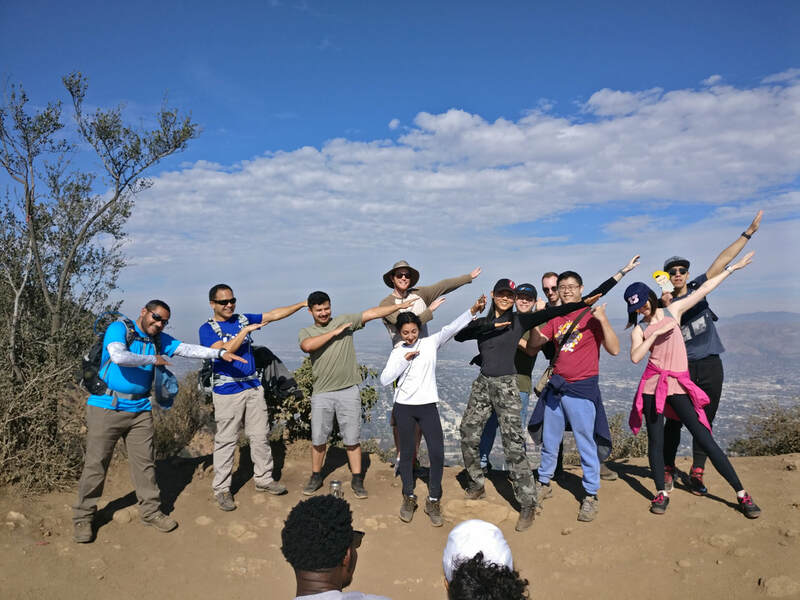 We joined up with ASCE and LA County Public Works for an amazing 11 mile hike that brought us up to the highest peak in the Angeles National Forest. We were able to trek up rocks, journey through the strawberry meadow, and enjoy the beautiful trickling stream that only runs from time to time. We had a great group of 6, with lots of fun stories and exciting info on what they were working on as we galloped through this fun and exciting hike! Our first technical tour of the new year was quite uplifting as we learned about all the data JPL collects from the Deep Space network to how the spacecrafts are assembled before being ready for launch. Our amazing tour guide Luis Andrade was even able to give us insight to his experience working on the Cassini mission to Saturn and show us where he sat and worked on the guidance of the spacecraft. This tech tour was definitely one not to miss and we'll be looking forward to our next technical tour. This month we hiked to Echo Mountain. It was a chilly and windy day, so it made it nice to do this fun 2.5 miles up and 2.5 miles up and back trail. We got to explore the destroyed ruins of the long lost railroad up to Echo Mountain and the ruins of an old mountain getaway. This hike brought soaring views past Downtown Los Angeles and beyond. Definitely a rewarding hike that did not disappoint. We hope to see you next time as we do these hikes every month. Usually on the last Sunday of the month unless holidays are near as was this month. 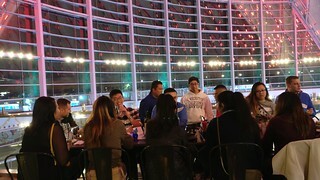 The UCI EAS Holiday Mixer this year was at the Anaheim Regional Transportation Intermodal Center (ARTIC). It was a great success with fun had all around from great conversations to winning this years raffle and guessing game! 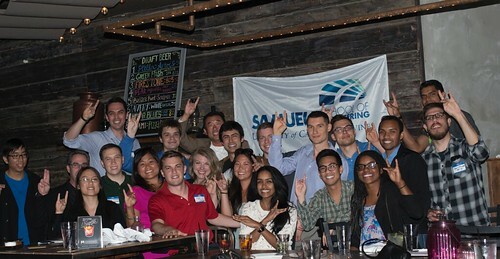 We had a lively group of engineers, alumni and friends and really took over the Oyster Bar SKC! As we kick start the Holiday Season, we want to wish everyone a fun and festive holiday with family, friends and loved ones! 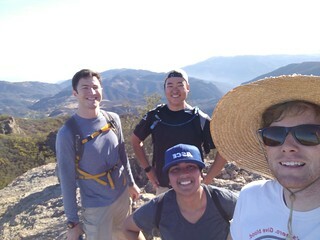 This month we went to Sandstone Peak in the Santa Monica Mountains near West Malibu. We had a fun group and got to see 360 degree views of the valley, ocean, and amazing clouds that blanketed everything below us. It was a beautiful day and we saw all sorts of beautiful and unique rock formations! ​We continue these events on a monthly basis on the last Sunday of each month. Our monthly brunch and bowl is always a fun time, where we go to Corner Bakery at 11 AM and then head to Irvine Lanes nearby after brunch. After enjoying bowling, some even make their way to Boomers adjacent to Irvine Lanes. This November, the bowling alley was reserved for an event, so we moved on to Boomers and played ski ball along with the other fun activities there! Our annual leadership retreat got together general members, our board, and any others who were interested in learning more about our organization together. We stayed in the beautiful desert of La Quinta, CA. We learned many valuable leadership skills such as emotional intelligence as well as strategic planning. This valuable workshop and planning session helped motivate us and inspire us for a successful year of events and tours for the 2018 year. We look forward to a great year with all of you and hope to inspire others to give back to the university as well as to other alumni. Our 3rd Annual Student Alumni was quite a treat! From great talks from both deans of the ICS and Engineering Schools to great food thanks to our school. People joined in and mingled sharing conversations on jobs, past experiences at the school, and even found some partners to work with on side work projects and hobbies. A special thanks to our UCI Engineering and ICS schools for all of their support in planning this event and helping to make it the success it was! 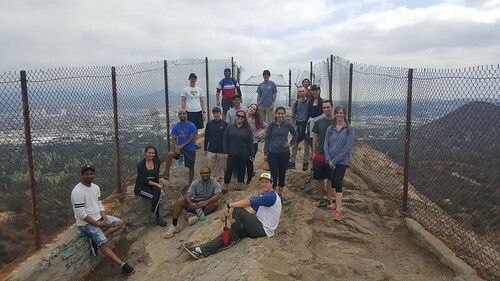 Join the president of the UCI Engineering Alumni Society for some good hiking and catch a bite afterwards at Father's Office of West LA. 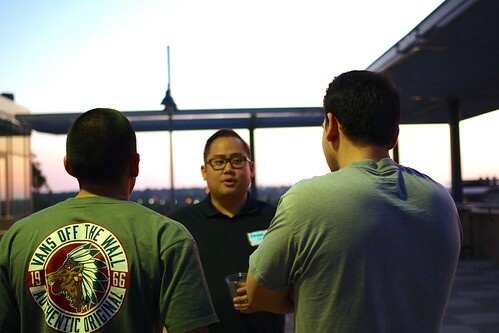 ​Come network with UCI Engineering Alumni Society Members and special guests. We will be serving drinks and food with your ticket as well as have some fun activities. 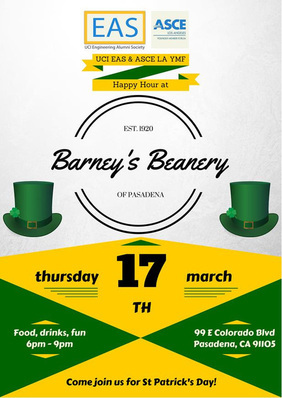 Come celebrate St. Patty's Day a day early and relax after almost finishing up the work week while socializing with some of UCI's best! Join EAS for brunch at Corner Bakery's on Harvard and then enjoy some bowling at Irvine Lanes after. If there's still time and people are up for it, we'll go to Boomers after for the batting cages. Come join EAS for our annual ice skating social at Anaheim Ice! We'll be there from 7 to 10 pm. General tickets are $11 and skate rentals are $4. Everyone joined UCI EAS to celebrate our school at UCI and reminisce. People joined us at us at our booth all day long and got to learn more about UCI EAS and what we do as well as enjoy playing a UCI EAS founder created game, "Zot Ball!" Afterwards, we watched the Homecoming basketball game against CSUN. 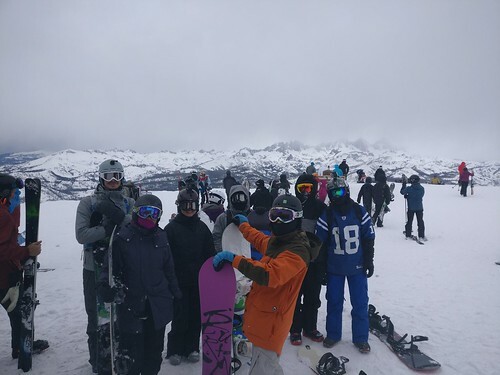 We spent a weekend in Mammoth Mountain Resort and had plenty of fun from great eats, powder runs, and great memories. Snowboarding trip with one night stay at cabin TBA. Cost is $50/person and includes dinner, breakfast, and snacks for Saturday. Eat brunch and Corner Bakery and then head over to Irvine Lanes for some discount bowling! 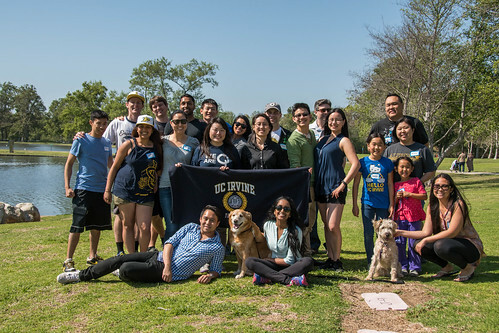 This Family Day at William R Mason park was a fun event where we enjoyed a fun day with the family playing board games, ultimate frisbee, water ballon toss, 3-legged races and tasty bbq and UCI bonding. Happy hour with UCI Engineering Alumni Society and American Society of Civil Engineers LA Younger Members Forum!!! 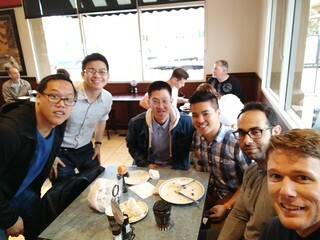 Who: Anyone interested in meeting UCI engineering alumni and civil engineers in the LA area! What: Come join two great engineering groups for a fun St. Patrick’s Day before a fun Family Day the next week! We will enjoy some fun festivities that only St Patrick’s Day will bring. 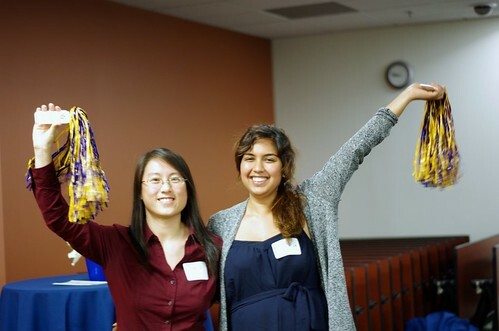 Why: Network with engineers, UCI alumni, and celebrate this fun day! ​​﻿﻿﻿Come join UCI EAS for a social hour on a special day: Groundhogs Day! Even better, King's Row has happy hour all day whether you want food or drinks! This gastropub is in beautiful Old Town Pasadena has great food and drinks and is a great place for us all to reminisce on our times at UCI and talk about what we are doing nowadays. So join us for great food, great drinks, and amazing company! 3pm-4:30pm: Join us at our booth for a chance to win some free UCI swag including the UCI EAS custom pint glass and sign up for our UCI EAS custom t-shirt design contest! 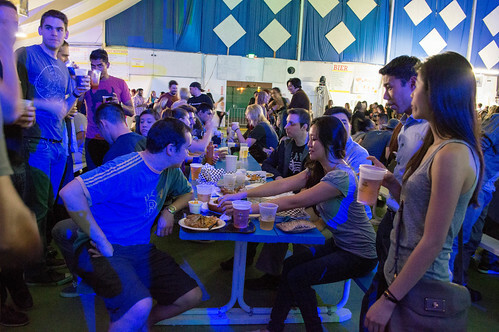 4:30pm-6:30pm: Grab some food at the food trucks or pub and join us at the beer garden for some socializing. Be sure to register for the Homecoming for free UCI memorabilia and tickets to the basketball game here. We hear there's a big storm coming this winter, and that means we're looking forward to some fresh powder! Come join us at our next event taking place after the holiday season at Snow Summit. Whether you're new to the slopes and would like to learn with friends, get better or show us what you've got, everyone is welcome. Snow Summit has a great lodge and other local snow activities (tubing) for those who would like to meet up, but do not ski or board. We'd love to get a group of 20 or more going, so bring your friends! Our events are open to everyone! - Leave LA/OC by 6:00am by the latest to arrive by 7:30/8. It takes about 1.5-2 hours from LA/OC to get to Snow Summit so please plan accordingly. Traffic may be heavy or snow chains may be required. Lift tickets are going to be $50. Start sending your payments to our LA Events Director, Emily, at [email protected] through any of the following banks: Bank of America, Capital One, Chase, First Bank, US Bank, Wells Fargo. They are affiliated and will transfer over if you are a member of one the banks listed. Nothing new to sign up for. Just go through your online banking! If you are a beer fan, science fan, UCI fan or Star Wars fan, come join EAS in supporting the Columbia Memorial Space Center in another one of their Science Pub nights. When they come to the orange county area, it's always at one of our favorite breweries, Bottlelogic. Above all else, this particular event's guest speaker will be Professor Michael Dennin from UCI's School of Physical Sciences. Here's the snippet on the event from the CMSC on the event. Hope to see you there! ﻿Come join UCI EAS in the German tradition of Oktoberfest! There will be plenty of good food, drinks, and fun social activities. If you’re in Orange County or Los Angeles, this is centrally located for all, so be sure to make it out to meet new people and do the chicken dance (which is a big Oktoberfest thing for those of you who don’t know). Purchase tickets for $15 through our payment website with paypal, which include a free UCI EAS pint glass, by Wednesday October 7th (while ticket supply lasts) or purchase them directly from Alpine Village here. The event does not allow glass inside, so we’re also going to have mini socials before Oktoberfest so you can visit us to pick up your glass beforehand. ﻿UCI EAS will be showcasing a special coming out during the School of Engineering’s 50th Anniversary and Hall of Fame celebration Saturday October 3rd, 2015. For a young engineering school, we have come a long way to building our own unique engineering alumni society lead by its members. Come out for some food and drinks at the Radisson Hotel while Dean Gregory Washington talks about the history of the UCI’s engineering and recognizes key engineering alumni. Currently admission is free, so register while it lasts by clicking on this link. If you are not able to attend that Saturday night, but would still like to be a part of celebrating UCI’s 50th Anniversary, the school will be putting on a Festival of Discoveries. Come with us to check out what our young school has been able to achieve within 50 years. The showcase will be during the day on Saturday October 3rd, 2015. 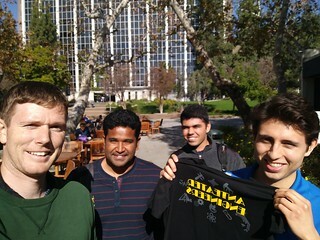 UCI EAS will be hanging out at the pub and then heading out to the Festival in Aldrich Park. Please feel free to email us if you are interested! Your friends at ASCE OC YMF, SWE, and UCI Engineering Alumni Society are hosting a fun night of social drinking at the new and exciting Downtown Santa Ana. The Bar Crawl will start at 8pm and we will hop around to all the new and exciting pubs and bars. There is a little bit for everyone if you like cocktails and especially if you love beer. In Downtown Santa Ana everything is within walking distance and easy to get to. We will start the night at the Good Beer Company on 4th St. At 10pm we will head over to the 4th Street Market area which has lots of food and a bar inside. At 11pm we will head upstairs to the Native Son Alehouse. If anyone is left at the end of the night, we can head to the Arts District bars. Friends, family, and significant others are welcome to attend. While parking is readily available, it is strongly advised that everyone take a cab or get picked up by someone. Please send us an email if you are interested in coming with your name and phone number. You’ll receive information of how to get in touch with us the night of. 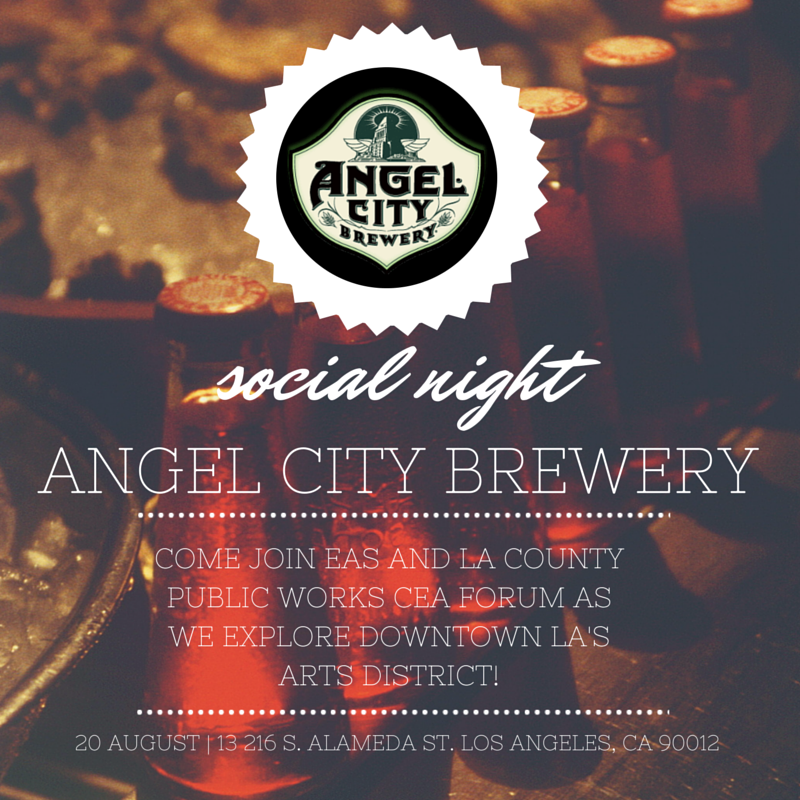 ﻿Come join UCI EAS and LA County Public Works CEA Forum as we explore downtown LA's Arts District! A recent Deloitte study revealed that over 70 percent of millennials want to start their own business and prefer to work independently rather than joining a traditional business environment. At the same time a vast array of resources are lowering the cost of starting companies: Cloud and social media technologies are cutting the expense of technology infrastructure and marketing. Funding for early-stage startups is more available than ever. Startup incubators and accelerators are popping up everywhere. Amid all this activity two things are becoming clear: Entrepreneurship is becoming the new normal and UC Irvine is here it help! The UCI Engineering Alumni Society is teaming up with The Institute of Innovation (The COVE) to host – “Leveraging UC Irvine to Launch Your Start Up” – and exciting panel discussion and networking opportunity to learn how you too can start your own company right out of school! Discussion topics will include recruitment of talent, technology licensing, growing a customer base, and attracting investment. Don’t miss this opportunity to network with fellow alumni, faculty, and friends of the university! Please Click Here to RSVP Today! 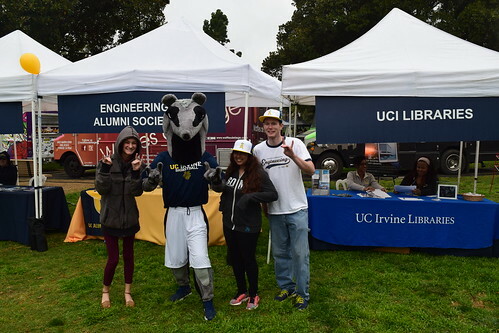 As Engineering Alumni Society is an official chapter of UC Irvine Alumni Association, our goal is to provide UCI alumni and UCI affiliates with professional, social and community engagement. In the interest of serving our UCI community, we request that all UCI affiliates (alumni, students, faculty, staff, etc) attending limit their non-affiliate guests to two attendees. Thank you for your understanding. Come join UCI Engineering Alumni Society as we solve our way out of a locked room! We’ll have one hour to work together to solve puzzles and clues to win the game! It’s only fitting that the Exit Game escape rooms were designed by engineers! Please be advised, you may need to crawl through narrow spaces so you should wear comfortable clothing. It is approximately $28/person. If you have any questions, please let us know. 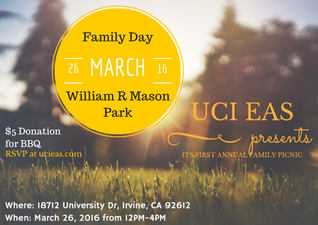 ﻿Come relax with UCI EAS for a fun day in the sun at Bolsa Chica State Beach. This will be a relaxing day for anyone who wants to enjoy the beach during the day, enjoy the campfire and smores at night, or enjoy it all. We will be playing some friendly games of football and enjoying the cool beach water. We will be setting up near the West end of the beach to enjoy the free parking West of Warner (turn right instead of left into the paid parking area). 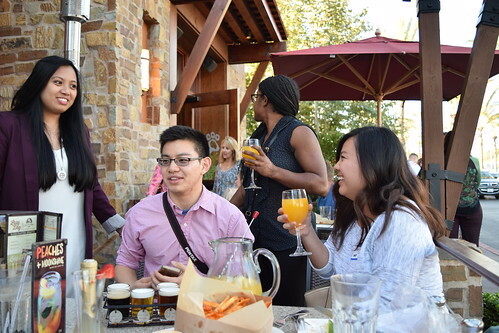 Come join the UCI Engineering Alumni Society for a fun night of food, drinks and networking at Lazy Dog Restaurant and Bar in Irvine. 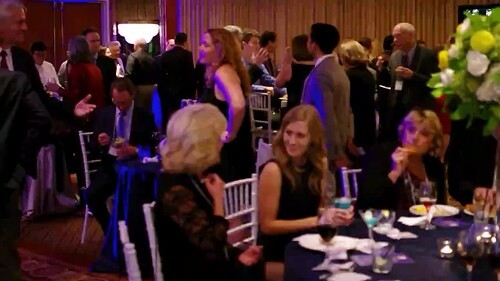 Enjoy eclectic menu options, a warm atmosphere and conversations with professionals and alumni. Dogs are welcomed! 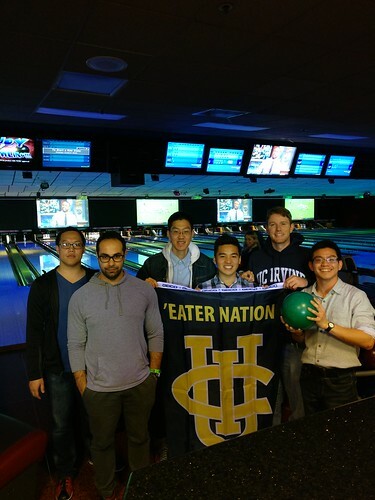 ﻿​Join UCI EAS for a fun night on Thursday, June 18, 5:30pm - 9pm at Bowlmor Pasadena alongside the civil engineers of LA County Public Works for some bowling, billiards, ping pong, great food and drinks! This will be a great networking opportunity in a fun social environment. Be sure to send your RSVPs to [email protected] if you’re interested in bowling, so we can reserve enough lanes to accommodate our party. Bowling is approximately $6/game and $5 for shoe rentals. Ask the rental desk for help locating our party or look for our yellow UCI flag and blue and yellow balloons. 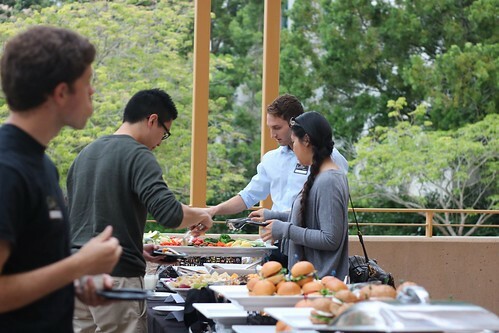 Come and socialize with your fellow Anteaters on Thursday, June 4, 6pm - 9pm at Bosscat Kitchen and Libations. Choose from a great selection of Southern style food and great cocktails and beers! ﻿﻿​The event will run from 6:30pm-9pm. Feel free to drop by anytime. The Dean of the School of Engineering will be speaking at 7pm along with a few other speakers until 7:30pm. After that, we will open up to networking among each other and the students. Come and see the history of UC Irvine in the making from the past to the present and shadowing the future. Join us and unite our community under the same roof.